Though Cinco de Mayo is still a few days away, I thought I’d head down to 18th Street and start celebrating early by making tamales at home! I had long thought making tamales would be difficult but oh no. While it may take a bit of time to cook the pork, the rest is a snap. And the extra pork can be used to make tacos or burritos, or just add your favorite barbeque sauce for a quick and delicious lunch! Take tomato and garlic and mix in blender. In a small sauce pan over medium heat, heat canola oil for one minute. Add onion and sweat until translucent, about 2 minutes. Add tomato mixture and increase heat to medium high and reduce for 5 minutes. Take corn husks and soak in water, set aside. Combine Maseca, baking powder and salt in a bowl and mix well with lukewarm chicken stock to form a soft dough. Whip lard to incorporate air and make fluffy. 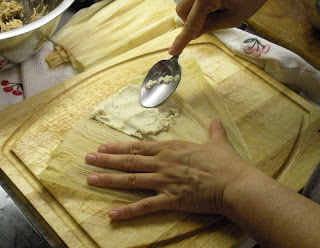 Take the Maseca dough and spoon it onto the corn husk. 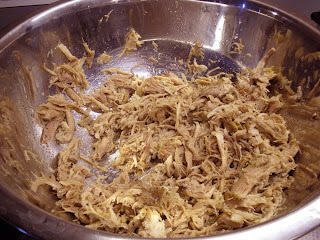 Mix shredded pork with sauce and apply to center of Maseca dough. 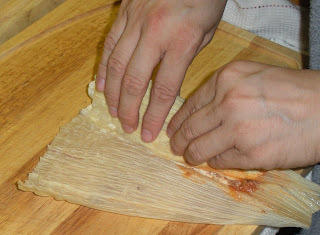 Roll the tamale like a burrito, making sure that Maseca dough completely covers meat filling. Put tamales in a steamer and steam for 1 hour. The dough will easily separate from corn husk when done. 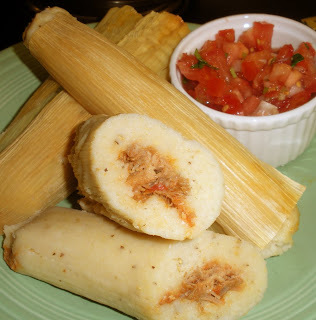 The tamales I prepared were authentic, where the meat plays second fiddle to the corn flavor of the Maseca dough. However, I generally prefer my tamales with a little more meat in the center. *You can also buy Maseca with the shortening already incorporated. In that case, simply add the baking powder and salt and then combine with chicken stock to form a dough. I’ve seen Maseca and corn husks at Whole Foods. But if you’re in Chicago, I strongly suggest making a trip to 18th Street in the Pilsen neighborhood to Del Rey (1023 18th Street, Chicago), where the corn tortillas are warm and the Maseca comes right off the production line. Del Rey also sells wheat flour products but manufactures them at another location so there’s less reason to worry about cross contamination! I bet you didn’t think you’d ever be able to enjoy the kind of cupcake we once loved as kids. Attention allergenistas! Swirlz Cupcakes in Lincoln Park is a little slice of heaven for all you cupcake lovers out there! With over 30 different varieties Monday through Saturday, Swirlz bakes something for everyone, including all sorts of vegan and gluten-free flavors. And come back often, as the menu changes every day! I recently sat down with Swirlz co-owner, Pam Rose, to learn more about this special treat. 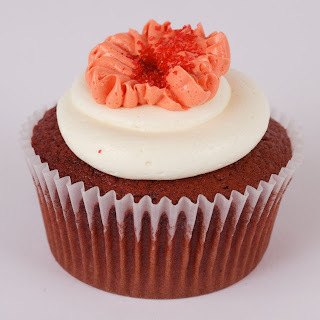 What inspired you to sell gluten-free cupcakes? Pam’s partner, Margot, was gluten intolerant. So when the store was just getting off the ground and she and her team were taste testing recipes, Margot couldn’t participate. That sent a real message to Pam and she began to develop alternatives for her partner and ultimately, us! What is your best-selling cupcake? Chocolate Peanut Butter Crunch. Pam offers her condolences for those with nut allergies. That’s coming soon. Lots of Pam’s customers swear they freeze the cupcakes and send them to family members with great success! What do you do to ensure there’s no cross-contamination? How do you get the cake to be so moist and fluffy? Swirlz orders a custom-made flour mix from California (the name of her supplier remains top secret!). The company uses a special technique that involves steel cutting the whole grains together, as opposed to individually cutting them and then trying to mix them. Pam discovered that this method yields a more consistent product and one that rises better than other gluten-free flour mixes. If you’re in the suburbs or if you plan to visit Chicago, make sure you add Swirlz to your itinerary. You’ll be glad you did! And I’m happy to announce that Swirlz has agreed to bake cupcakes that will be served as our dessert for our June 29th Safe & Sound Dinner at Carnivale. Space is limited so make your reservations today. 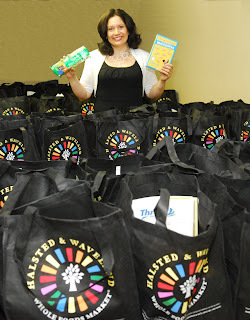 Win FREE Tickets to the THRIVE Allergy Expo and Meet Lisa! The Thrive Allergy Expo, North America’s only gluten-free exhibit, will be held this weekend, April 18 &19, at Chicago’s McCormick Place. Want free tickets to the Expo? I have 9 pairs of tickets for each day. The first 9 people for each day who email me at info@lisacooksallergenfree.com (Please specify Saturday the 18th or Sunday the 19th will receive 2 complimentary tickets for that day! You can also see my presentation--“Cooking with Food Allergies at Home”-- on Sunday, April 19 at 10:30 AM. (NOTE TIME CHANGE). The presentation will be held at the Marketplace Forum and is part of the Demos and Lectures on Living with Food Allergies series. Rose’s Wheatfree Bakery and Café in Evanston is the first gluten-free, certified bakery in Illinois. Although Rose’s bakery does regularly use tree nuts, the Safe and Sound Dinner menu will be free of the 8 major allergens and gluten. 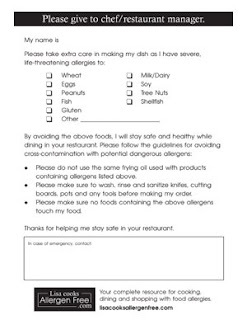 Rose and her team have designed a wonderful, seasonal menu , and we’ve taken extra precautions to make sure your dinner will be a safe and sound one. Indeed, all Safe and Sound dinners will implement the necessary safeguards. Dining out can generally be a frightening, intimidating experience. When I was first diagnosed with food allergies, I would wait till I got home to eat, a particularly challenging feat when you’ve been out all day and really need a bite to quell your appetite. The good news is that you take steps that will significantly reduce the risks that can occur when dining out. 2. Give the restaurant a heads up you’ll be dining there. · If they seem hesitant or uncertain, ask to speak with someone else or pick another restaurant. Your health is worth it! 3. If the service and food are good, offer the restaurant a special thanks and spread the word. The more we support restaurants that adapt to our needs, the more restaurants will be willing to make accommodations. · Be especially cautious at buffets. It’s much more difficult to control for cross- contamination with shared utensils and spillage. · If your meal is deep fried or cooked in oil, make sure your order is prepared separately from those where allergens are used. · A good place to gauge a restaurant’s commitment to health and safety is to inspect the state of the restroom. I had to shake my head in disbelief today that we’re already a week into April. How did that happen? It also means we’ll soon be getting together with families and friends for Easter and Passover. I had so much fun creating these holiday recipes. 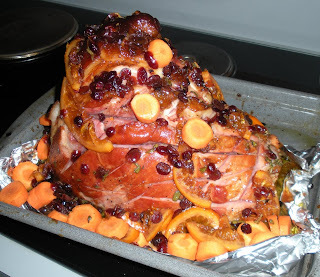 The glazed ham with orange and cranberries is especially delicious. Make sure to ladle the sauce over the meat when you serve it! Roast red peppers until the skins are fully black; place peppers in plastic bag and remove skin by rubbing off in bag. Remove seeds and membrane, then dice and set aside. Bring water and salt to a boil in a large stock pot. We will next perform what’s known as blanching and shocking. It’s a fairly simple procedure that involves immersing the food in boiling water for 1-3 minutes (the time depends on the food) and then immediately placing the food in ice water in order to stop the cooking process and keep the vegetables crisp. Beginning with the corn, blanch for 3 minutes and immediately place in ice water. Next, blanch the asparagus for one minute and immediately place in ice water. Take the asparagus and cut them—on an angle--into bite-size pieces; add to bowl. Sprinkle red peppers and onions over asparagus mixture. 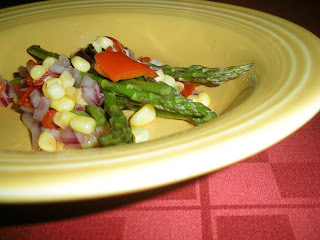 In another bowl, mix dressing ingredients and lightly drizzle over asparagus salad. Score the ham on the fat side with slices 2” apart and about ½” deep and place ham in a roasting pan. Cut a diamond pattern into ham by repeating slicing pattern in the opposite direction. Season the meat with Kosher salt and ground black pepper rubbing into slices. Take ½ of sage leaves and dice and mix with extra virgin olive oil to form a paste. In a sauce pan over medium heat, add canola oil, orange, cranberries, orange juice, brown sugar, water and spices. Slowly reduce liquid to a syrupy stage; this should take about 30 minutes. Coat ham with syrup and cook for another 25 minutes, basting with syrupy juices every 5 minutes. Blanch and shock carrots and add to ham 10 minutes before it is done (will be in pan for 2 bastings); cook until the carrots are tender and the ham is crispy and glistening. In a food processor, grate the potatoes. Line a strainer with a cheese cloth and place over a bowl and squeeze out some of the moisture from the potatoes. Let cheese cloth drain for 15 minutes. Pour off liquid, but leave starch from potatoes in bowl. Add shallots, egg replacer (egg replacer is mixed with water and added to mixture right after it is mixed), tapioca starch, rice flour, Kosher salt and ground black pepper to the starch. Returned drained potatoes to starch mixture and thoroughly incorporate. In a large skillet over medium high heat, add canola oil until hot. Dry potatoes as much as possible to keep oil from spattering. 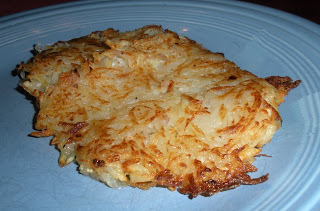 Drop heaping tablespoons of potato mixture to skillet and cook for 3-4 minutes or until latkes are crisp and golden. The Thrive Allergy Expo, the only allergy and gluten-free expo in North America, will be held April 18-19 right here in Chicago at McCormick Place. More than 10,000 people with food allergies are expected to be in attendance! I’ll be wearing many, many hats at the Expo. You can see my presentation, “Cooking with Food Allergies at Home,” at 10:30 AM, on Sunday, April 19. The presentation is part of the Demos and Lectures on Living with Food Allergies series. Make sure you drop by and visit me at my booth. You can register to win a dinner for 6 that I’ll cook and serve in the comforts of your own home. Best of all, I’ll be giving away sample products from companies that couldn’t make it to the Expo. Because supplies are limited, it will be first come, first served. When you get hungry, make a stop at the allergen-free concession stand. I consulted with Restaurant Partners—a collaboration between the Levy Group and the Stefani Group to oversee McCormick Place concessions—to ensure their menu was safe, sound and full of great options for you and your family. Don’t forget to bring the kids to see Rock’O, the allergy peanut sniffing dog. Rock’O is a Portuguese water dog that works with the Angel Service Dogs, a non-profit organization that provides alert dogs for anaphylactic allergies. I look forward to meeting everyone and hearing your experience living with food allergies. Remember, we can all learn together!